Shortly after my milk came in my son began spitting up large amounts of the consumed breast milk and I figured it was normal until I took him to his two-week appointment and found he was a full pound under his birth weight. I was urged to see a lactation consultant immediately. When he was 3 weeks old I learned some good breastfeeding techniques and felt much more prepared for breastfeeding. The nurse was very helpful and will be discussed in another post. She could not believe how much milk he was spitting back up and told me to get him to a pediatrician. We weighed him before feeding and after feeding and also after spit up and found he was losing too much during the spit ups. I set an appointment with a local pediatrician but was severely disappointed. I waited in the waiting room with my newborn for 2 hours past my appointment and when we were finally seen the doctor said he was fine and just to keep feeding him. The appointment lasted a whole 3 minutes and I was devastated. He began spitting up even more often and in larger quantities, about 5-10 times per feeding and probably .5 to 1.5oz so we saw a new pediatrician who diagnosed him with Gastroesophageal Reflux Disease (GERD) and prescribed him medication. For a few weeks he spit up a lot less and it was thicker when it came up (so less projectile), but he still was spitting up more than regular babies. (See picture to the right of an example of just how much and the type of spit up it was. This was right after a bath and at least 1 hour after eating.) We began carrying around receiving blankets as burp cloths and still ended up changing his outfit 4-5 times a day. At the same visit we also scheduled an ultrasound to see if one of his stomach muscles wasn't working correctly, a condition called pyloric stenosis. We went to the ultrasound and Dylan was so good as they put the jelly on his belly and took a look. It came time to give the bottle and I proudly presented an empty bottle and a storage container with the first 3 oz of breast milk I had ever pumped. I was then told that they just wanted to feed him water because breast milk is too gassy. Needless to say I was kind of mad and confused as both my doctor and the receptionist has made sure to tell me to bring breast milk. Oh well, at least I started pumping. Anyhow, Dylan did not have the stomach issue but we still didn't know what the problem was. After a few weeks the medicine lost its effectiveness and we discontinued using it. In June 2009 we had an ER visit when one of his refluxes caused him to stop breathing a few times and then left some thick mucus in the back of his throat that he couldn’t clear and I couldn’t suction out. As these issues finally started clearing up I noticed he had swollen eyes and upper lip so we were afraid he was having an allergic reaction to something and were advised to bring him to the ER. It turns out the swelling was just from him crying which makes sense because he was completely inconsolable during the episode which lasted 20 long minutes. We were in the ER for several hours while they waited to see if the event would occur again, though of course it didn't. 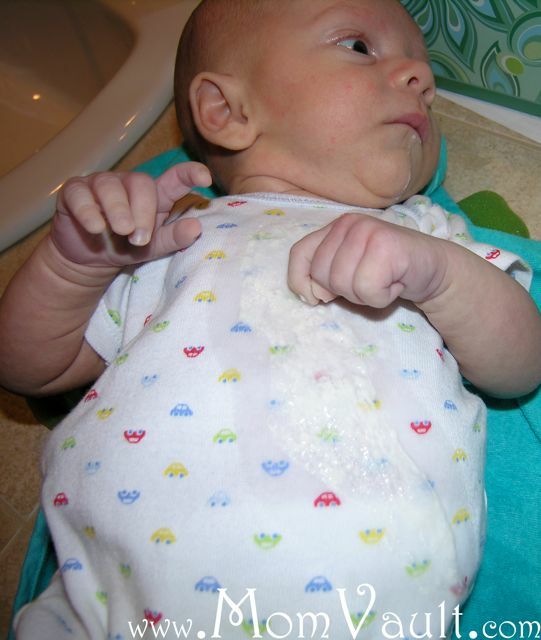 In October 2009 I watched a show called Mystery Diagnosis where a boy had a diaphragmatic hernia with symptoms that matched Dylan's... which would explain the unusual color, quantity, and consistency of spit up, his lack of gaining weight in the first two weeks, and the persistent stomach pain/colic symptoms. At his next well-child appointment I asked if she thought it was a possibility and she agreed to have him x-rayed for this condition. "A diaphragmatic hernia is a birth defect in which there is an abnormal opening in the diaphragm, the muscle that helps you breathe. The opening allows part of the organs from the belly (stomach, spleen, liver, and intestines) to go up into the chest cavity near the lungs." (Google Health) So basically, if part of his stomach is pushed through the diaphragm then some milk could be stuck there and then when he is moved it rushes into the stomach or up the esophagus and out his mouth. This would explain why some of the milk that came up appeared undigested. Right after that appointment we were able to get him the x-ray and the lady had me remove any metal he was wearing and put him in this baby torture contraption. Dylan was so good, she actually said the contraption was made to make the baby cry so the lungs will be full of air when the x-ray is taken but Dylan just patiently looked around and babbled like it was hold hat to him! She said only one other baby had not cried during this but she was just so sick that she couldn't cry. The x-ray came back and he did not have this issue either! Between 7-8 months Dylan's reflux was quieting down enough that we stopped being concerned with it and he was fully done with it by the time he was a year old. At no time were we asked to put formula or cereal in his milk bottles, nor were we encouraged to feed him solids any sooner than 6 months. It is quite a journey for any parent to deal with this, especially if it is their first child. I commend all parents that deal with these conditions and hope that my experiences have helped you feel you arne't alone.